The OMNI-BLOK� 154 Series makes installation and replacement of Nano2� surface mount fuses easier and more efficient. 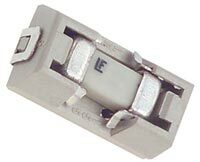 The combination fuse/holder can be installed on a PC board in one step. Fuses can be replaced without opening the PC board to the adverse effects of solder heat. Nominal Melting I2t: 0.904 A^2 Sec.